This is twenty-ninth in the series on the rich cultural heritage of ancient temples in India. The ancient temples are richly carved and each of the carvings surpass each other in their mastery. Inside the Kailasa Temple of Ellora surrounding the maim shrine there is a pillar courtyard. This courtyard has several panels depicting various legends of Shiva and Vishnu. In this courtyard there is a gallery of twelve panels depicting Shiva legends. 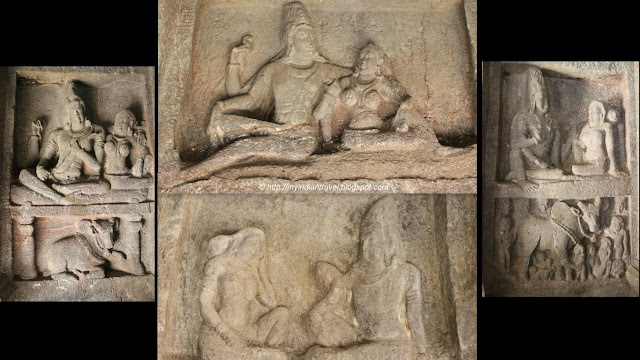 On these panels there are Shiva and Parvati in various attitudes. On the external wall of Mallikarjuna Temple, Basaralu there is a beautiful sculpture of Karthikeyan on peacock. Poetry in Stone is the perfect title for your beautiful series Rajesh. These are beautiful. Beautiful carved panels. These temples are truly a great historic treasure. The peacock sculpture is beautiful......I'm glad you explained it......thank you! Boa tarde, bem..tive dificuldade na tradução, mesmo assim acho, que a foto é o máximo, é sempre bom apreciar e saber mais sobre historia. Thanks for the wonderful pictures of the sculptures! I love my voyages into India! Amazing site...these temples are huge and so are those picturesque panels. Amazing place, and I love the details. Superb captures of an amazing place as always, Rajesh!! I always look forward to the incredible places you share with us!! I hope your new year is off to a great start!! Enjoy!! This is truly extraordinary, beautiful and inspired. Unas imágenes muy bonitas..un saludo desde Murcia. Hello, awesome photos and a lovely visit to the temple and shrine. Happy Tuesday, enjoy your week ahead! More wonderful architecture and history - excellent! wonderful photo's again... quit rich and cultural. I am amazed by the size of this temple and the carvings. More poetry in stone and amazes me they are in good condition ~ Great photos! Stunningly beautiful! The Kartikeyan idol is sculptural beauty! You bring life to the pics with your shots! Have you ever thought about writing a book about all the legends of the Hindu gods, and illustrate them with the photos of the temples? I expect that tourists will be very happy to buy such a book! Enjoying your exquisite temples in between visiting our own here in Myanmar! Few years back i decided to visit this place and to feel closely every corner of this place but still not been able to manage a tour. Very nice shots may be this post will work as catalyst and help me to plan a tour.